Multi-level deck design allows you to use your outdoor space to best advantage. Add a secluded upper deck outside a bedroom. Build a tiered deck to enjoy the vistas of a rolling landscape. There is no end to the possibilities. 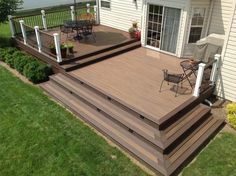 A skilled deck contractor will assist you in designing the deck that perfectly suits your purposes. But what is the cost of a multi-level deck? There are many factors in deck price, and they are discussed below. 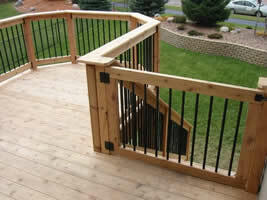 The average multilevel deck is about 400 square feet of decking that includes a single stairway of 12-14 steps. This table shows total cost for typical projects that are 400 total square feet. Use the square footage costs for decks smaller and larger than 400 square feet. The range of two-story deck cost from $15.50 to more than $38 per square foot is broad. Understanding these factors and how they affect cost will assist you in forming a budget for your project. Number of stairs: Building stairs is time-consuming, and therefore costly. Additionally, a large number of stairs requires extra support and possibly footings too. Accessories: Simple accessories include plain spindles and rails. Items that increase cost include wide rail tops, built-in benches, decorative post caps, extra-wide stairs and landings as part of the staircase. Finish: The cost to finish a wood deck with sealer or a stain/sealer combination is about $2-$4 per square foot. You can save about half that amount by doing the work yourself. If you tackle the job, be sure to research proper deck preparation for sealing/staining. Finishing it properly ensures your deck and your financial investment are protected from the elements. Complexity: Rectangular decks with wide planks running perpendicular to the joists are the simplest decks. Complexity increases for non-rectangular decks, planks running diagonally, very narrow planks, decks built around obstacles such as a large tree and similar difficulties. Decks with wide spans that must be supported with additional footings and beams increase cost too. Terrain: Installation on sloped terrain takes longer and requires more support materials. Additional excavation might be needed too. These factors increase cost. Permits: Your installer should know whether a permit is required for your deck. If you’re unsure, call your local building department. While an extra cost, a permit includes one or more inspections that help ensure your deck is built safely and securely. 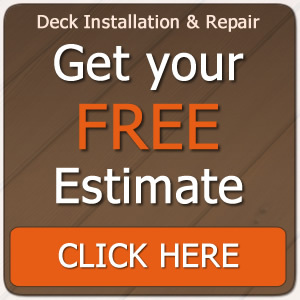 Who does the work: Deck installation is hard work and takes time, so you’ll earn the money you save doing it yourself. However, pro installation of a multi-story deck is recommended due to the complexity of the work and safety concerns with elevated decks of any kind. 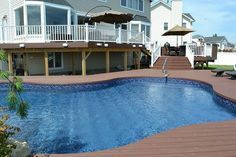 It’s possible to invest your entire budget in the deck without considering the cost of extras that will enhance your enjoyment and safety when using the deck. This table will assist you in putting together a comprehensive budget. Water control $7 to $15/sq. ft. Lighting: This is a crucial element for evening entertaining when not gazing at the stars. Several well-placed lights near the stars are essential for safety and limit your liability as the homeowner. If your electrician can use existing lines and circuits, your cost might be less than $750. If you get extravagant with lighting, cost could be higher. Consider solar lights too! Landscaping: A few well-placed shrubs will help hide footings and support posts. Trees for shade are nice too, but with them comes the need to clean up leaves and debris. The budget in the table is a minimum. It’s easy to go well past that. Heaters: Though highly inefficient – it’s outside, of course – a portable propane heater can keep the chill off those gathered around it. Another option is a wood-burning or gas fireplace built into the setting, but those can cost $1,500 to $5,000 or more. Furniture: No deck is complete without comfortable deck furniture including casual chairs and couches plus a table and chairs, preferably with an umbrella over the setting, more suitable for eating. Screened area: If mosquitos are heavy where you live, having a section of deck screened off gives you safe haven when a breeze isn’t keeping the bugs away. Storage: Hauling gear in and out of the house or garage is a hassle. 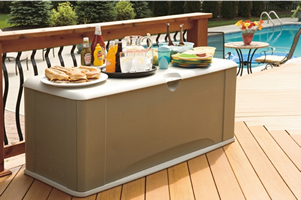 Attractive resin deck boxes double as “counter space” for food and beverages. Water control: When you want to create outdoor living space below any of the decks, the underside of the deck must be enclosed, so rainwater doesn’t fall through. Downspouts must be installed to carry the water away. Aluminum and vinyl are the materials most commonly used for enclosures and downspouts. Water control of this type can cost up to $10 per square foot, a significant additional cost not shown in the table above since it is not commonly done. Multi-story decks raise safety, privacy and access issues. We’ve addressed those and more in our Decking Guide to Elevated Decks. The guide also includes pros and cons of elevated decking that you might want to review before making the decision to install a two-story deck. One additional issue is worth mentioning – a gate to the stairs. We recommend a gate in front of any staircase of more than a few stairs. The gate should swing onto the deck rather than over the stairs. It’s a safeguard for young children and anyone who might make a false step. Gate cost is included in the table of extras above. Here are common questions about two-story / multi-level decks along with answers. Power wash the deck every year or two, more often if it is visibly dirty. Seal/stain a wood deck according to the installer’s recommendations (usually every 2-4 years depending on climate and use). 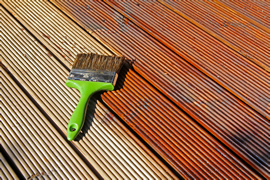 When staining a wood deck, use a product that includes UV inhibitors to prevent fading. Wipe up spills like BBQ sauce quickly to prevent staining. Check for repair issues twice per year. First, repairs made in a timely manner will prevent the damage from becoming worse. Secondly, and most importantly, a damaged deck is an unsafe deck when rails, gates and stair treads fail. What are common uses for the space beneath an elevated portion of deck? If the underside of the deck above is fitted with drains, so water won’t leak through, then a patio is a common usage. Patios can be DIY projects for as little as $3 per square foot or $10-$20 per square foot for professionally installed paver stone or finished, stained concrete. When the deck above drips, then many homeowners use the space for storage. Waterproof storage sheds and large patio/deck boxes are a good choice. Such boxes are great for the deck too! Is there anything I shouldn’t store beneath a deck? Yes. We don’t recommend storing firewood or lumber beneath the deck. It attracts insects and rodents, and that’s too close to your home for comfort. Nothing that might mold or rot should be stored beneath a deck. If it gets wet, it won’t receive the air and sun required to dry, and mold will result. A deck that isn’t built properly won’t look good and might not last as long. 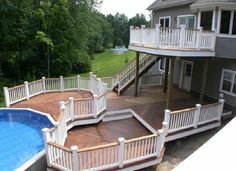 In short, the quality of the installation has a lot to do with how much enjoyment and how little hassle your deck gives you. When you’re ready to hire a qualified deck builder in your area, we can help. The service we offer is free, and there is no obligation. All you need to do is to fill out one quick form providing the basics of the project. You’ll receive written estimates from three pre-screened deck installation companies where you live, and they know they’re competing for the work. 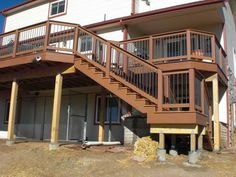 It’s an excellent way to find the right combination of experienced and affordable Multi-Level Deck installation. 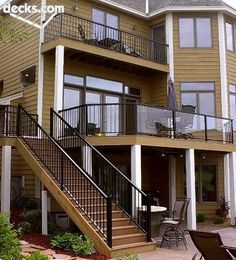 Best Multi Level Deck Design Ideas For Your Home!